Finally a good cover. Like this font very much. And the brackets are cool. The only thing that bothers me is the far left side of the picture. Think you should crop just a few pixels from the left side. Good composition and I like the movement and the laughter. Excellent job! Wonderful warm tone, just like a shot in a magazine with a simple text. Also like a people in this shot. Good luck. I find the album cover appealing. The color tones and light source are very nice. Nice feel to the photo there are a few things that takes a bit away. The placement of the text and the large blank area at the bottom also the lady in the middle must have moved as she is OOF where the other lady is not! A very classy cover. Love the colour. Very warm and inviting. I know I'd pick this up to investigate further. Well done. This shot has a very distinct feel to it. Very cool. I really like this shot. I could definitely see it used as and album cover. 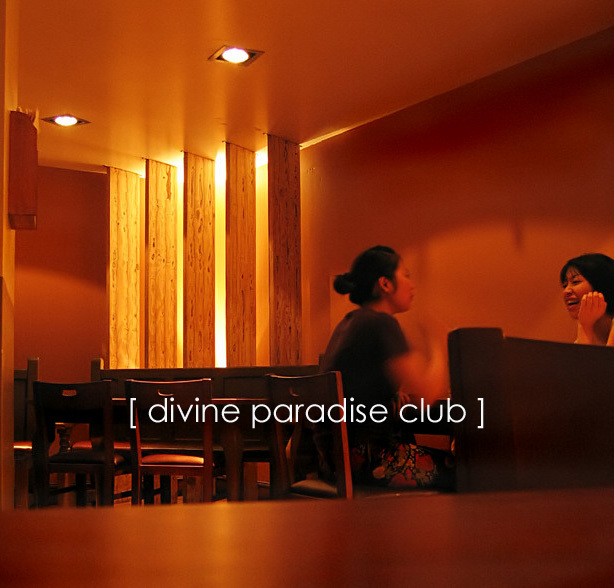 The only thing that I personally would chage is the placement of the "divine paradise club". Being that it is over a busy area of the image, it sort of gets lost. I would like to see the name down in the lower left-hand corner ormaybe just above their heads. Anyway, good shot. the simplicity is the best part of your cover. also, your title design is the best in the challenge. Proudly hosted by Sargasso Networks. Current Server Time: 04/19/2019 04:15:18 PM EDT.